A belly rub with fame | Go. Do. Be Dog. As I listen to a presentation on Different Thinking Styles, I’m reminded of a story from a few years ago when I was working for a construction contractor. We brought in a business consultant; an expert in planning. He handed out sketch paper to the leadership team and asked them to create a picture of where they envision the company to be in ten years. The construction managers, those who had oversight over the making of Dayton skyscrapers as they were, drew pictures of high rise buildings and cranes. Drawings of cities being reborn. The Finance guy made an organization chart. For anyone unfamiliar with the name Temple Grandin, a very nice bio can be found on Wikipedia, which is well worth the time to explore. Briefly, here’s a summarizing statement of Dr. Grandin from the Wikipedia website. Temple Grandin (born August 29, 1947) is an American doctor of animal science and professor at Colorado State University, bestselling author, autism activist, and consultant to the livestock industry on animal behavior. She also created the “hug box“, a device to calm autistic children. The subject of an award-winning biographical film, Temple Grandin, in 2010, she was listed in the Time 100 list of the 100 most influential people in the world in the “Heroes” category. What’s missing from that first Wikipedia paragraph is that Dr. Grandin was diagnosed with autism at age two. At a time when autism diagnoses were uncommon and resources available to families were frustratingly few. 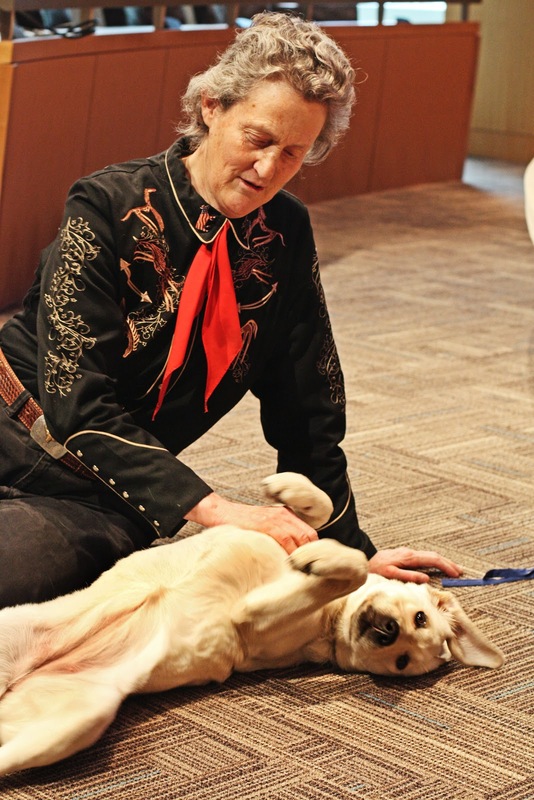 Temple Grandin is a woman commited to breaking through barriers for people with autism. She is an fierce advocate, speaking out to raise awareness and understanding. At the presentation I attended last week, she focused on how some of our visual thinking youth are being overlooked for employment in big business. Society must recognize that different people think in different ways, Dr. Grandin tells us. She believes that all minds, no matter how different, have something to contribute to society. And if different minds are nurtured and brought together, they should be able to solve new and complex problems. In the business world, verbal thinking is not better than visual. Just as visual thinking is not better than analytical. We need to understand how each person’s view is critical to the success of a business. Temple Grandin is a much sought after speaker and I was jazzed to be able to attend her presentation. Her website has a schedule of her upcoming presentations. I encourage anyone who wants to understand more about Autism and Asperger’s to attend one of her talks. So, speaking of different ways of thinking. You know I’ve never been the kind of girl to shy away from a bad decision. So it seemed reasonable to me that I would take Euka II with me to the talk. Sure, I knew it’d be about two hours or so. But Euka’s a good girl, so mature for her four months. 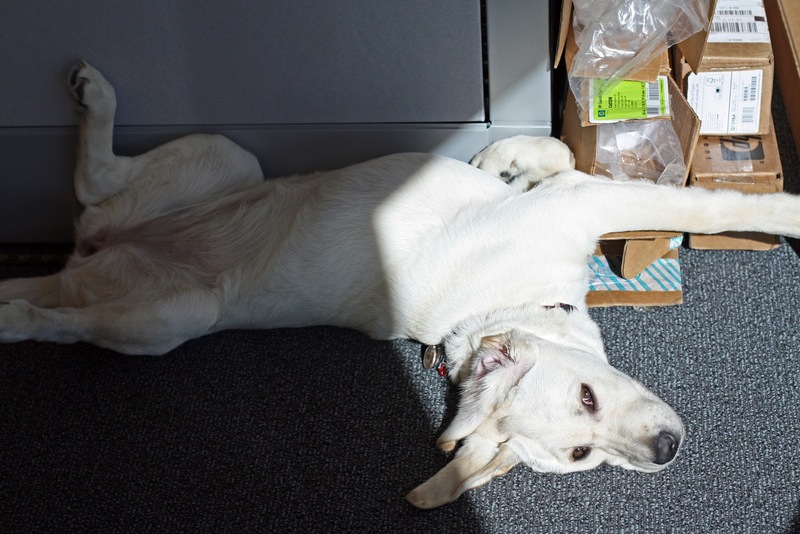 Whenever she’s in the office, the pup sleeps much of the time. She’ll be fine. In hindsight, I recall that while she does get some solid nap time in during the day, it’s only in the afternoons. This, after she’s spent all her energy in the morning being a four month old puppy. Criminy, was she fidgety. In an auditorium of four hundred folk, she was happiest when reclining in the aisle way. Little Miss Curious, she wanted to check out every one of the faces behind us. At one point, I looked down to check on her and see her on her back, legs spread wide like the girly goods needed a close inspection. Oh my. On the plus side, I see that relaxed posture as some serious confidence in the pup. I mean, really, who does that? In a filled auditorium, with the occasional outburst of robust applause, she’s got her soft belly exposed to all in a cocky bring-it-on attitude. Dang, girl. Ok, so duly noted and now let’s see how well you can do an Under, Euka. I bring her closer to my chair and under the table top. 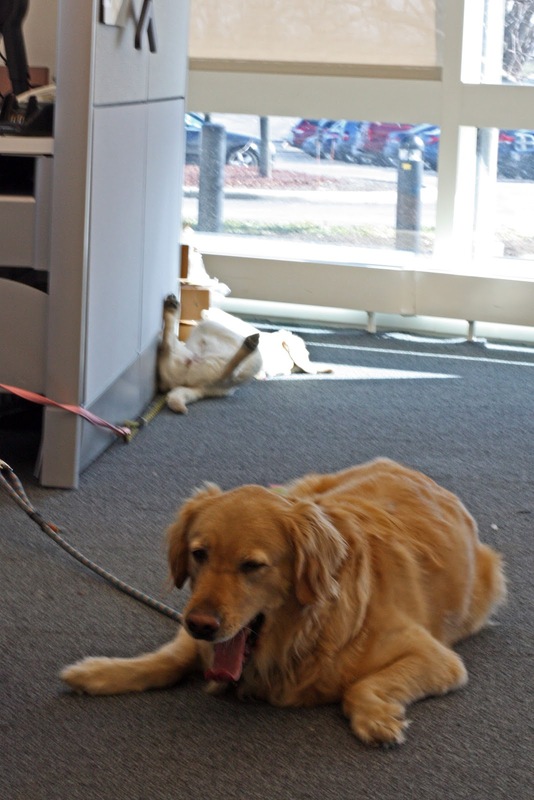 A service pup in training must be invisible at these events, I tell her. To be honest, it was a struggle. The pup is convinced all these folk are here to observe the ethereal pale beauty that is Euka II. And to see the view from all possible angles. But after two hours of negating exhibitionist behavior, at least I’ve got a clear idea of what to work on next with the princess. And like the parents who give their kids raisins at church to keep them still, I’m offering up dog biscuits as bribery. Euka!, I whisper to her. If you put your legs together and lie down over here, there’s a cookie in it for you. After the presentation, Euka worked on her calm greetings with folk passing by. She was so good!, they said, offering a palm up for a Shake. You wouldn’t believe she’s just four months old. C’mon, you said to teach her everything I know. Posted in Euka II. Bookmark the permalink. Hi Melody! CCI requests that the pups in training be neutered or spayed at six months. Unless they are selected as candidates for the breeding program, as the girls in the E litter have been. Only the best of the best are considered for this, so just another reason to feel good that our E pups are something special. Wow, what a great opportunity you had to be able to hear Dr. Grandin speak. And it sounds as though it was also the perfect opportunity for Euka to practice some of her new skills too. Job well done Euka!